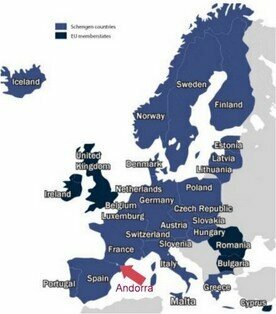 Is Andorra in the EU? This is a common question that is often wrongly answered. Andorra is not in the EU but is along with San Marino and Monaco negotiaiting a special accord which details are as yet unknown. Andorra is not part of the Shengen area but as it is land-locked by France and Spain and has no direct access. For travel to Andorra then the Schengen visa requirements will be the same as if you are traveling to Europe. You should also if you require a visa in your passport hold a multiple entry visa as you will be leaving the EU and re-entering when you leave Andorra. In fact any nationality not already part of the Schengen countries are ALL subject to the 90 day rule in that they must either register with that country´s authorities or must leave the area before the 90 day maximum visa free "allowance". Andorra is treated as an EU state where trade in manufactured goods is concerned, but not for agricultural produce. Can I stamp my passport when I enter Andorra to extend my 90 days allowed? Technically yes, realistically it depends on who is on duty at the border and whether they can be bothered to find the stamp. Andorra has random border checks and tourist "Immigration stamp collectors" looking for that souvenir can get a tourist stamp BUT this is undated. To get an officially dated exit stamp from Spain and then an entry at the Andorra side is not guranteed at all. I do know persons have been successful and I know some who have not been so lucky. If you are entering by bus then the chances are far higher to be checked than by private or hire car, and also by entering on the bus it is far more unlikely that they will wait for you while you chase the officials for that stamp !! In January 2011 one potential passive resident applicant on a single entry visa was unluckily stopped by a random border check on a bus from Barcelona to Andorra and was refused entry, so beware of the risks of a single entry visa. I should add at this stage that non EU persons applying for work permits must have in their passport a valid multiple entry Schengen visa, but for passive residency this does not appear to be a requirement for the actual processing of the application once in Andorra, but due to the reasons above any potential applicant should get a multiple entry visa. 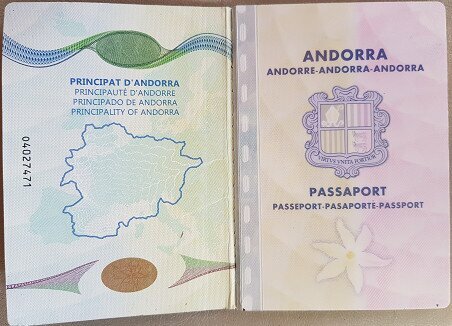 Once in Andorra it becomes irrelevant that you will exceed the 90 days Schengen or the passport visa as long as you have the residency card once you leave from an EU airport. This as explained below is important as holding an Andorran residency permit exempts you from any Schengen visa or entry requirements ( including transit visas). So what does the actual law say on Schengen ? The Schengen Area comprises the territories of 26 European countries that have implemented the Schengen Agreement signed in the town of Schengen, Luxembourg, in 1985. The Schengen Area operates very much like a single state for international travel purposes with border controls for travellers travelling in and out of the area, but with no internal border controls. 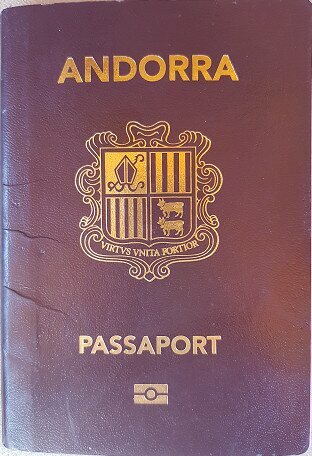 Just how do I get an Andorran passport ? The passport is not to be confused with the green residency card. You cannot apply for Andorran citizenship until you have completed 20 years onbroken residency (10 years for Nationals of Spain, France and Portugal). It is illegal under Andorran law to have dual nationality so you are required to renounce your current citizenship if you choose to apply. "Décret n° 2003-740 du 30 juillet 2003 portant publication de la convention entre la République française, le Royaume d'Espagne et la Principauté d'Andorre relative à la circulation et au séjour en Principauté d'Andorre des ressortissants des Etats tiers, signée à Bruxelles le 4 décembre 2000 (1) "
...."The system of entry and movement in France and Spain of foreigners holding a residence permit of Andorra is identical to that applied to foreigners holding a French or Spanish residence permit ....."
That accord treats foreign residents of Andorra on the same terms as if they were foreigners resident in Spain or France. Click here for the french link. Click here for the spanish link. So having established the equality with foreign residents of France and Spain in this accord, let's go back to the principle Schengen Agreement to see what provisions there are for foreign residents in France or Spain.
" Foreigners who are holders of a residence title of a Schengen state may freely enter into and stay in any other Schengen state for a period of up to three months. For a longer stay, they require a residence title of the target member state. " That appears to be the legalities, at least in as far as France and Spain are concerned. It should also be added that Andorran citizens are also subject to the 90 day rule in theory. I myself was almost prevented from boarding an aircraft in Singapore returning to Barcelona. The officials at the checkin demanded to see my onward flight to Andorra (!) as their computer was (correctly) saying that an Andorran passport holder could only spend 90 days in the EU! Suffice to say that finally apologies were received. I have been asked whether arriving in Schengen from outside with an Andorran residency permit at say Frankfurt would be OK. This is academic and really depends on which official is on duty and what his interpretation of the situation is. Sadly Schengen laws are complicated and understood correctly by almost no-one. However the above accord with France and Spain does guarantee visa free entry into Schengen for to entry into or exit from France or Spain. My advice is, if your passport is subject to Schengen lengths of stay, to enter Schengen area via France and Spain as much as possible and have your residency card with you and even a print out of the accord as highlighted above in your back pocket to prove your entitlements, especially if you are entering or leaving Schengen area through another member country. I know from first hand experience that entry to Europe via France and Spain has not been a problem when you produce your Andorran residency permit. I have also been informed that difficulties can arise if trying to enter Europe via another Schengen country. Unfortunately in practice when travelling to the Schengen states from all over the world, how many airline check in staff, supervisors, Immigration officials have ever heard of Andorra, let alone the Accord with France and Spain !! I hope this goes some way to explaining Andorra and Schengen. Once again this is another advantage of passive residency for those outside the EU who would normally require Schengen visas to enter Europe.